Cassandra Wanzo ’73 arrived at Northwestern in 1969 as a wannabe theater major. “Then I started wondering, ‘Why am I paying all this tuition to be a starving artist?’” she remembers. Shifting her career goal from performer to doctor, she began researching which classes she’d need to take to prepare for medical school. Before long, she found a perfect fit. She’d meet all of the necessary requirements if she majored in nutrition, a degree offered through the College’s Department of Home Economics. If you graduated any time within the last 40 years, it probably comes as news that Northwestern even had a home economics department. The whole concept sounds like a retro blast from the past, a reminder of the days when traditional gender roles ruled and women were groomed to be housewives. But the College’s department was far from a pre-feminist stereotype. Wanzo’s nutrition degree, for example, required the same rigorous science classes that any pre-med student would take. The College’s Department of Home Economics, which existed from 1943 to 1973, was designed to offer as rigorous a curriculum as any other liberal-arts field. The department’s goal, according to its longtime chair Ruth Bonde, was to “bring together, interpret and disseminate the knowledge which will aid families in decision-making.” In other words, students were trained to think critically and problem-solve rather than to cook and sew. As Bonde wrote in an article for the Journal of Home Economics in 1956, most private American universities founded in the 19th century offered a traditional, classical education, where courses in Greek philosophy and Renaissance art were intended to improve the mind, not lead to a specific career. That began to change as state universities proliferated across the country and an increasing number of Americans went to college. Soon, students were demanding more practical, job-oriented classes, which led to the founding of engineering, agriculture and business colleges. Home economics, a discipline designed to bring scientific rigor to domestic labor, fit neatly into that “practical” niche. Northwestern adapted to these changes in higher education, opening what eventually became the Kellogg School of Management in 1908 and the McCormick School of Engineering in 1909. In 1911, an editorial in the “Women’s Edition” of the Daily Northwestern asked for courses in “domestic science,” claiming that some female students were leaving the university because none were offered. Scott’s proposal went nowhere, but the right opportunity came along 20 years later, in the midst of World War II. Chicago’s School of Domestic Arts and Sciences had been founded by a group of women philanthropists in 1901, with the goal of producing well-trained domestic servants. By the 1920s, it was offering diplomas in “homemaking” and “community food service” (for example, running a restaurant or a cafeteria). Women who were engaged or newly married could take a six-week “Bride’s Course,” which included classes on money management, cooking, meal planning and “table service.” After enrollment steadily declined in the 1930s, the assets of the school were taken over by Northwestern in 1943. In the 1940s and ’50s, the department, based in Fisk Hall, offered interdisciplinary courses in a range of family- and home-related topics, including child development, personal finance, meal planning, textiles and home management. One signa­ture class was “The Individual, Marriage, and the Family,” and a 1955 syllabus (preserved along with the rest of the program’s records in the University Archives) shows the impressive breadth of topics it covered. Speakers included a medical school professor (for sessions on the reproductive system and childbirth); a psychology professor (discussing “emotional needs in marriage”); a law school professor (who addressed the legal and financial aspects of marriage); and a professor from the Garrett Biblical Institute (who presented “Functions of the Family Today” and “The Changing Role of Women”). Students also took a field trip to the Chicago divorce court. From the beginning, the department was designed to complement other fields of study, not simply cater to home economics majors. A chemistry major could take courses in food preparation to train for a career in a consumer-food laboratory, while a journalism major hoping to work at Good Housekeeping or Better Homes and Gardens could take electives in home furnishings or consumer buying. Indeed, the department often hosted high-level professional women to serve as inspiration for students. One list of guest lecturers from the 1940s includes Elizabeth Blair, an interior decorator at Marshall Field’s department store; Elizabeth Beyer, a nutritionist at the National Dairy Council; and Margaret Saurer, a home economist at Kraft Cheese Company. (Yes, “home economist” was an actual job description at the time.) The skills taught in home economics courses were never intended to be used solely in the home. By the 1960s, the curriculum was shifting with the times. There were still courses in child development and nutrition, but students could also take “The Development and Actualization of the Self,” “Public Policy and the American Family” and “The Family in the American Economy.” Classes in home decorating had been replaced by “Home Planning,” described in one course catalog as “an exploration of the forces which give shape to man’s environment … the relationship of technological, social, economic, and aesthetic elements affecting the nature and organization of housing and communities.” Although there was still a general departmental major, students could also specialize in environmental studies, nutrition and food sciences, and human development. But these attempts to modernize the department weren’t enough to counteract declining enrollment. The department was closed at the end of the 1972–73 school year, when there were only three faculty members and 10 home economics majors. 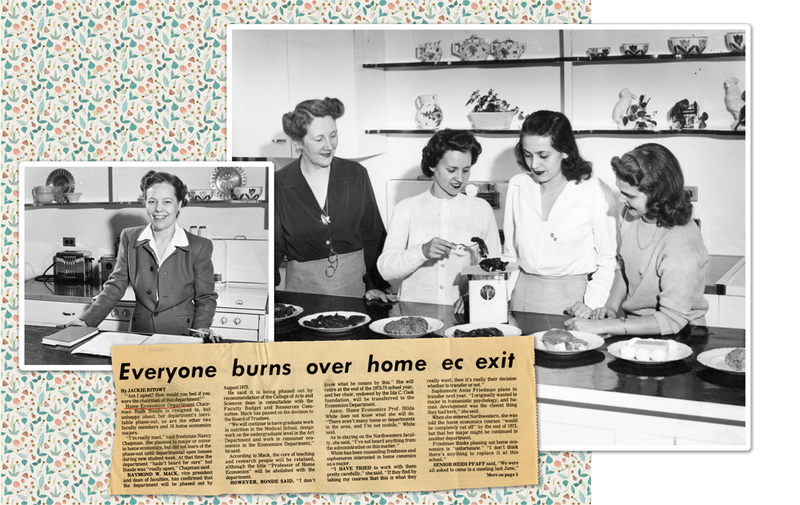 In a Daily Northwestern story headlined “Everyone Burns over Home Ec Exit,” Bonde was asked what she thought of the decision. Wanzo was one of those last home-ec majors, and she remembers being one of only two students in some of her final nutrition classes. (“Talk about a one-on-one education!” she says.) But she reflects on her years in the department with nothing but fondness and gratitude for the education she received. “Am I upset?” she asked. “How would you feel if you were the chairman of this department?” Bonde retired and lived in Evanston until shortly before her death in 1996 at the age of 90. Though she’d devoted her life to studying family dynamics, she herself never married or had children.